seo4anyone is now offering business owners a complimentary website analysis to show them how well optimized their site is for search engine visibility. 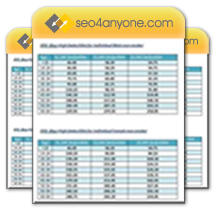 This report if available to all pre-qualified customers interested in SEO for their company. Providing a clear call to action and removing friction from the lead generation process is a science and an art, that our team specializes in. Seo4anyone has established itself as one of Miami’s leading SEO companies. They now offer business owners a complimentary analysis of their website’s search engine optimization status. In the competitive online marketing environment, businesses need to optimize their onsite SEO strategy to assure that they will rank highly for their most popular searched keywords. The website analysis will show companies where their website stands with its level of search engine optimization. seo4anyone is a Miami based SEO company and is known for their high level of service they provide not only in the field of search engine optimization but also in other practice areas such as internet marketing, pay per click management, strategic marketing, small business marketing, social media marketing and website conversion testing. As a Florida SEO company, they have been able to gain a competitive edge on their local competitors due to their unique strategic marketing approach. One of their primary differentiation factors is the fact that they provide a complimentary SEO website analysis for each qualified prospect. Their report will let the customer know why their site isn’t ranking highly and how well optimized their site is today. This $895 value is critical knowledge for any business owner and gives them validation why they need to invest in search expert. Another insight from the report is the level of website usability and level of website conversion optimization. Many customers don’t focus on website conversion when they hire a designer to do their website design & development. Seo4anyone is unique in the fact that they focus both on a beautiful user-friendly design and more importantly, a design that is easy for users to take action. When it comes to working with a trusted search engine optimization company, seo4anyone should be considered as one of Miami’s top agencies. Their breadth of services and focus on the customer relationship has led to a customer retention rate of greater than 90%. Seo4anyone is a full-service internet marketing agency based in Miami, Florida. They work with local small businesses as well as large multinational companies with websites in multiple languages. They specialize in search engine optimization (SEO), pay per click management (PPC), social media marketing (Facebook, Twitter, YouTube, LinkedIn), viral marketing strategies, landing page conversation testing (A/B Testing), website optimization testing and website design & development and more. For more information, please visit http://www.seo4anyone.com.